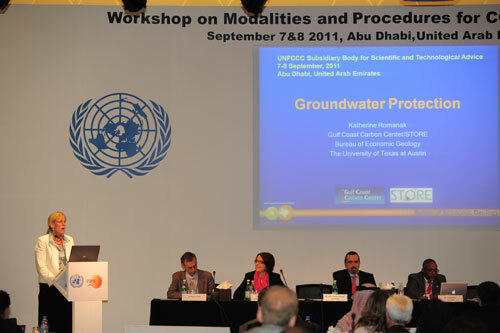 December 17, 2011: The paper "Role of partial miscibility on pressure buildup due to constant rate injection of CO2 into closed and open brine aquifer" by co-author Seyyed Hosseini has been published in the journal Water Resources Research. 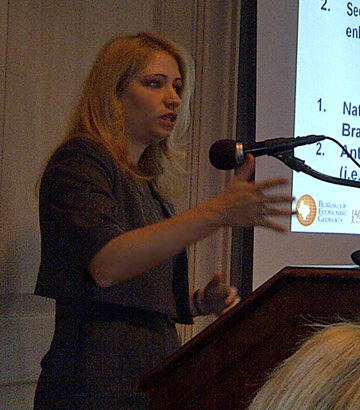 GCCC researcher Vanessa Nuñez speaks about EOR at the Petroleum Engineers Club of Dallas. 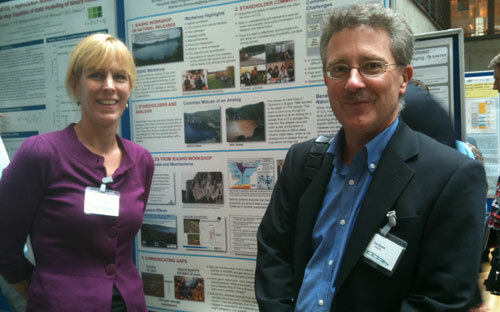 November 15, 2011: Two new journal articles on CO2 monitoring are authored by GCCC researchers. "Sensitivity of groundwater systems to CO2; application of a site-specific analysis of carbonate monitoring parameters at the SACROC CO2-enhanced oil field," by Katherine Romanak, and Rebecca Smyth, Changbing Yang, Susan Hovorka, and Jiemin Lu, has been accepted for publication in the International Journal of Greenhouse Gas Control. Jiemin Lu is lead author on a paper published in the Journal of Chemical Geology, "CO2-rock-brine interactions in Lower Tuscaloosa Formation at Cranfield CO2 sequestration site, Mississippi, U.S.A." For more information on the papers, please click here [PDF]. Meckel with other members of the Texas Assembly in Fort Worth. October 21, 2011: Next Generation Project: Texas Assembly. As a sponsored fellow, Tip Meckel joined 50 young leaders from around Texas to foster cutting-edge, innovative solutions to our shared global challenges. The Assembly gathers the best and brightest young business and academic leaders from around the state to discuss issues through rigorous, responsible debate. 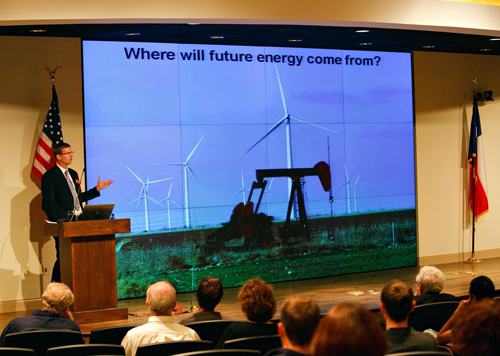 This meeting focused on energy, economic development, the environment, and U.S. global policy. Fort Worth, TX. October 8, 2011: Science, Engineering and Education for Sustainability Workshop: Natural and Engineered Carbon Sequestration. 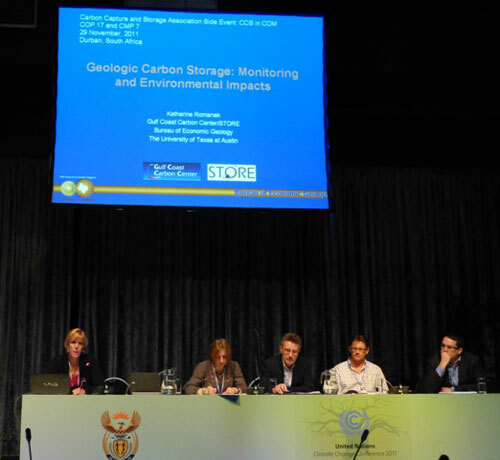 Jieming Lu attended and presented, "Comparing various monitoring methods for CO2 injection." Minneapolis, Minnesota, USA. 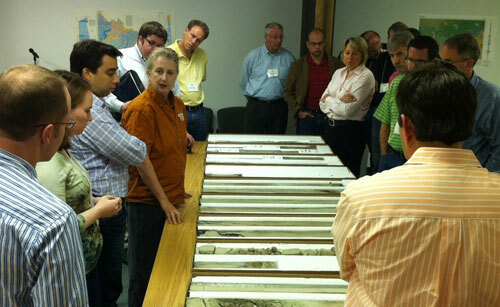 Sue Hovorka discusses Frio cores, EOR and carbon sequestration before a field trip to Denbury's West Hastings Field. 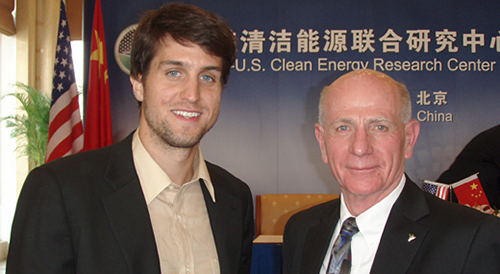 GCCC graduate student Logan West with Jerry Fletcher of West Virginia University, director of the CERC – Advanced Coal Technology Consortium at the CSLF Meeting in Beijing. Zahid Khandaker (back row, 3rd from right) with members of his presentation team at the IEAGHG Summer School. June 24, 2011: GHG Reduction Technologies Monitor This weekly newsletter provides information and insight on development of systems and technologies that will allow operations that inherently produce greenhouse gases to continue and adapt. The June 24 issue featured a new process-based method developed by Katherine Romanak and Changbing Yang along with other collaborators at GCCC for identifying leaks from CCS projects. Katherine Romanak and Tim Dixon of IEAGHG present new work on using natural releases of CO2 for stakeholder communication in Trondheim, Norway. 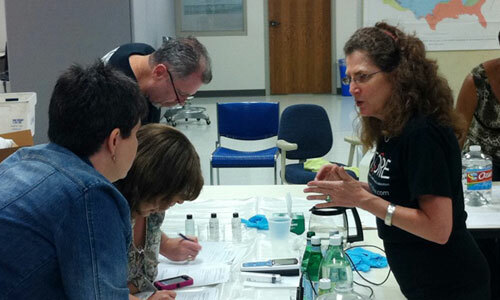 Becky Smyth discusses the geochemistry of carbon dioxide with high school teachers attending the STORE/TXSS Revolution workshop in June. 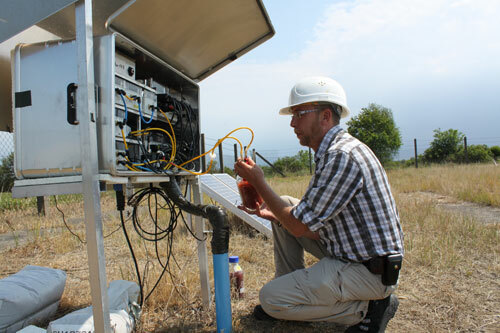 Stefan Schloemer of the Federal Institute for Geosciences and Natural Resources performs routine maintenance at a permanent soil-gas monitoring station in the Altmark Natural Gas Field. 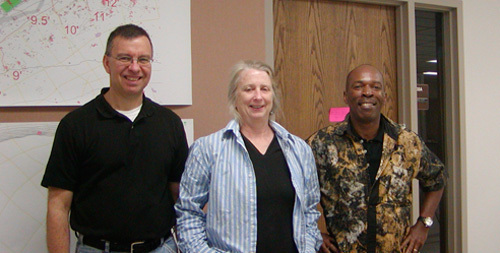 Ramón Treviño and Susan Hovorka with Joseph Yeddu (right) at the Gulf Coast Carbon Center. April 14, 2011: Imperial Barrel Award. Congratulations to The University of Texas Imperial Barrel team, which includes GCCC student Erin Miller. 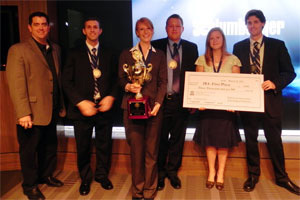 The team placed first in the most prestigious petroleum geosciences competition for students in the world. For a full report please see the press release: http://www.jsg.utexas.edu/news/rels/041411.html. GCCC's Erin Miller was part of the IPA team that brought top honors to Austin. Houston, TX. April 10-13, 2011: American Association of Petroleum Geologists (AAPG) Annual Convention and Exhibition. Tip Meckel, Erin Miller, and JP Nicot attended. Houston, TX. 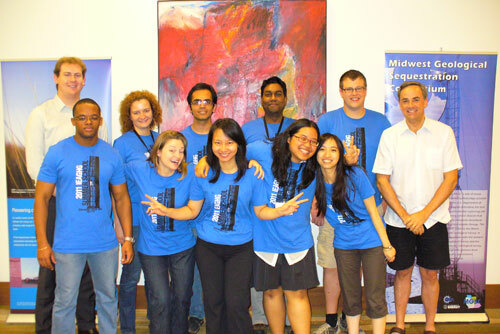 Romanak (in center wearing black and white) with UTSA engineering graduate students. GCCC's Erin Miller (second from right) with UT's Imperial Barrel Award winning team. March 22, 2011: An historical perspective on the GCCC and CCS is featured on the BEG's website. For full story, click here [PDF]. 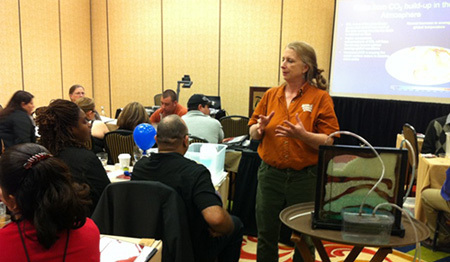 Susan Hovoraka discusses carbon sequestration with middle- and high-school teachers at STORE's Geoforce workshop. Juli Berwald, freelance science writer for the GCCC, shows students how hydrocarbons become carbon dioxide using styrofoam balls and pipe cleaners. March 5, 2011: Explore UT. During The University of Texas' largest open house of the year, GCCC's booth "What to do with CO2" explained the basics of carbon sequestration using models and demonstrations. GCCC staff Susan Hovorka, Khandaker Zahid, Jiemin Lu, Katherine Romanak, Seyyed Hosseini, Vanessa Nunez, Sigrid Clift, Carlos Puerta, Hilary Olson, and Juli Berwald, as well as BEG's Bridget Scanlon, Valentina Prigiobbe, Melissa Garcia, Ursula Hammes, Reuben Reyes, and Sojan Mathew took turns entertaining and educating a steady stream of elementary, middle, and high school students and their parents throughout the day. Tip Meckel delivers talk on carbon sequestration at the Austin Forum. January 8, 2011: The Texas Tribune. Susan Hovorka quoted in article "Aided by Oil, Carbon Capture Projects Advance in Texas". For full story click here.